At All Things New Again, we acquire old furniture pieces to repaint, refurbish and renew. Additionally, we love to design new furniture from old parts. This project began when we picked up a pair of old dining room chairs and decided to build a two-seat bench. I started by removing the legs, seat and frame from each chair. Dining room chairs are typically constructed with wood screws, wood dowels and glue. Useful tools for this step include a rubber mallet and a flexible flush-cut hand saw. Although the glue in old chairs dries over the years, making disassembly easier, dowels are often very stubborn—expect some to break. The flush cut saw will enable you to cut the dowel stub flush to the wood. Then, drill a hole for a new dowel right into the old dowel location. I then connected the two chair backs with wood glue and new dowels. I then used the old frame pieces to construct a new frame for the bench. Since some of my framing pieces did not survive the disassembly steps, I cut new pieces from 2×3 lumber. Reassembly of the bench frame and legs resulted in three sturdy legs in the front. Once I assembled the frame, it was time to cut a new plywood seat and foam cushions. For the upholstery, Cathy and I used a couple of layers of batting over the foam and then attached the fabric to the seat. This was my first project using my new air-powered staple gun—so much easier on the hands then a manual stapler! We painted the new bench to match the fabric. As a final touch, we decided to wrap the center post and part of the frame with jute twine. 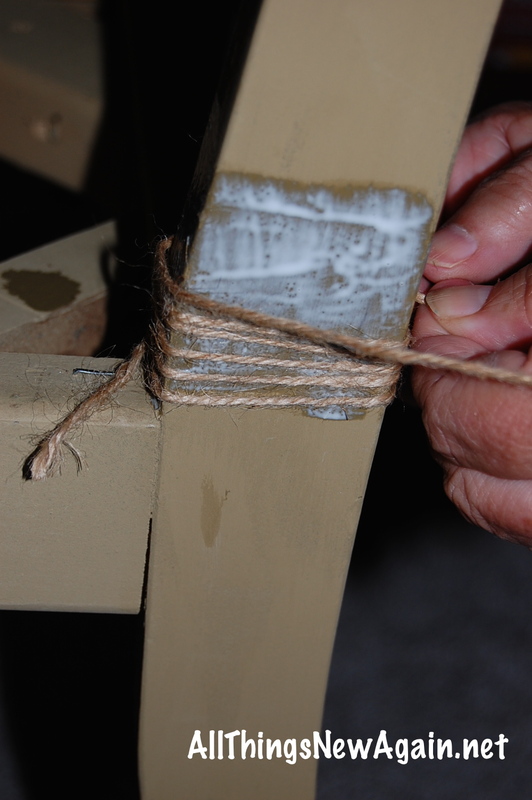 The twine compliments the paint color and adds a great deal of strength to the main joint between the two chairs. Here’s the final look at the new bench. All Things New Again is a family-owned furniture and paint boutique located in Leesburg, Virginia–about an hour or so west of Washington, D.C. We offer our own brand of eclectic hand painted furniture along with up cycled pieces we build like this bench. We also offer several lines of paint for your next DIY project along with painting classes and workshops. See our latest class schedule here. Stop by and see us the next time you are in town! I love it !! Good job Dave ! This is a great tutorial! The bench turned out great and I love the added jute twine. Thank you for sharing at What We Accomplished Wednesdays. Have a great week! Thank you Deborah! Wishing you a great week too!